This photo provided by Bees Wrap shows the wrap in use in a variety pack of colors and sizes. We live in a disposable culture. According to the U.S. Environmental Protection Agency, the average American throws out 4.4 pounds of garbage per day. If you are looking to reduce your contribution to landfills, there are products to help you replace some of the biggest culprits for disposable waste in your daily life. Many of us already have reusable shopping bags and water bottles, but here are seven products you can use (and reuse) to reduce the amount of garbage you dispose every day. To further reduce the waste of packaging, consider buying these products at a local store instead of ordering them online. Those thin plastic bags that hold your Brussels sprouts at the grocery store add up in the landfill. When you head to the store with your reusable shopping bags, add produce bags to the pile as well. You can purchase a set of three produce bags for $13.78 from EcoBags, available at Walmart and other retailers, opt for a handmade option on Etsy or make your own. No need for plastic wrap when you have this eco-friendly alternative. You can make your own or purchase a set for all your food wrapping needs. You can purchase a pack of three in different sizes for $18 from Abeego or Bee’s Wrap — you can also find a Bee’s Wrap stockist near you on their website. 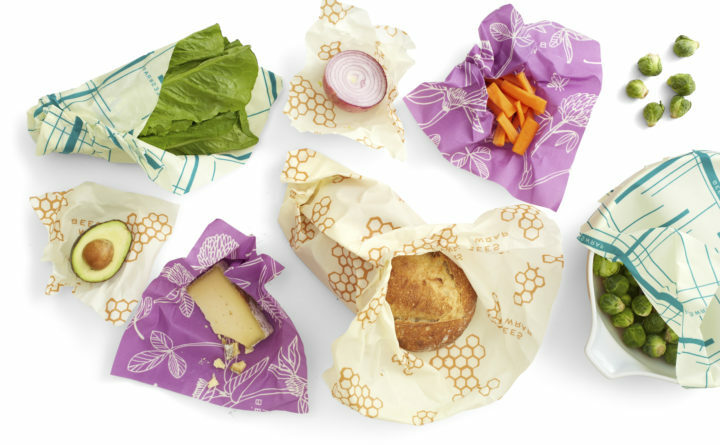 Keep an eye out local vendors who are creating their own beeswax food wrap as well. From Keurigs to coffee filters, your daily morning coffee has the potential to create a steady stream of waste. The Atlantic reported in 2015 that the number of Keurig pods in landfills laid end to end would circle the Earth more than 12 times. Consider buying a reusable K-cup filter, which are sold at many large retailers (including Target for $8.19). If you are not a Keurig fan, you can also get a French press from most any major home goods retailer to eliminate the need for disposal coffee filters. And make sure you are reusing those coffee grounds. According to the Trash Free Seas Alliance, the average American uses 1.6 straws per day, which end up in landfills and oceans — where, famously, they can find their way into the stomachs of seabirds and the nostrils of sea turtles. Cities like Seattle, Washington, and Berkeley, California, have instated bans on plastic straws, but you can take matters into your own hands by carrying your own straws. Stainless steel drinking straws with cleaning tools are available at many major retailers; Green’s Steel sells a pack of four for $14.99 (now on sale for $9.99). Metal is usually preferred for its durability, but there are also reusable straws available in different materials like bamboo (like this set of six for $6.95 from the Grove Collaborative) and glass (Hummingbird Glass Straws sells a four-pack with a cleaning utensil for $20). If you go out to eat for lunch or do lunch in the cafeteria, bring your own cutlery to reduce plastic waste from disposable spoons, forks and knives. Bamboo is lightweight and, unlike reusable plastic or metal counterparts, bamboo will biodegrade when you decide you want to update your cutlery set. To-Go Ware has a portable set with a pouch in a variety of colors for $12.95.